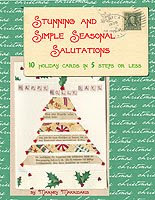 Designs by Lisa Somerville: FREE Giveaway: Stunning and Simple Seasonal Salutations eBook! FREE Giveaway: Stunning and Simple Seasonal Salutations eBook! Download a FREE copy of Stunning and Simple Seasonal Salutations, an eBook featuring 10 beautiful handmade cards, complete with photos and descriptive "how-to" instructions, showcasing a variety of techniques such as rubber stamping, collage, and innovative paper and mixed media arts. Click here to download your copy. ETA - I contacted Artella - the link should now be working - if not try refreshing your browser. Enjoy! Thanks for the link Lisa, I've downloaded a copy!